With faith and fortitude, dozens of area church leaders gathered at the Assumption BVM Church in West Grove on July 15 to formalize a commitment to helping families in need throughout southern Chester County through the creation of Family Promise of Southern Chester County. At the congregational agreement meeting, church leaders from twelve local churches confirmed their participation as host churches in the program aimed at alleviating homelessness, while an equal number of churches signed on to be support churches. Host churches are where families will be housed overnight, while members from the support churches will help provide meals and other support to the families. Faith leaders and social service workers throughout the area talked about the need for a program like this in southern Chester County, as a growing number of families find themselves without shelter. In the 2013-2014 school year, 494 students in the four southern Chester County school districts were impacted by homelessness. Gene Daunno, a coordinator at the Willowdale Chapel, said that he was shocked at the number of students who were homeless over the course of one school year, and this illustrates the severity of the issue, even in an area that is comparatively well off. Rev. Annalie Korengel is the pastor of the Unionville Presbyterian Church, the first church to sign on as a host church for Family Promise of Southern Chester County. Korengel said that members of her church immediately recognized a need for the proposed program, which is aligned with a Summit, New Jersey-based non-profit that has nearly 200 affiliates in 41 states across the country. The Family Promise organization has been assisting families that are in crisis for more than 25 years. With this program, host church congregations offer shelter, meals, and friendship for a week to three to five families—as many as fourteen individuals—four times a year. Overnight lodging is provided from 6 p.m. to 7 a.m. the next the morning. Each Family Promise affiliate has a resource center where the families stay from 7 a.m. to 5 p.m. The resource center is a place for the family members to shower, care for their children who are not in school, and seek employment, if necessary. The Family Promise of Southern Chester County’s resource center is located in downtown West Grove. The Family Promise executive director and case managers have offices at the resource center, which will open the door to other social service organizations that might be able to offer help to the families. One of the key aspects of the program is to keep the families together and to keep their lives intact as much as possible while they are going through the crisis. Family Promise of Southern Chester County officials emphasized that the commonly held image of homeless people as being alcoholics or drug users is not accurate. More and more families are finding themselves in a financial crisis as they are caught between a vice of high housing costs and low wages. Situational homelessness can arise because of the loss of a job or an illness. While Korengel has sympathy for anyone who is homeless, she is particularly concerned about the impact that homelessness, even for short periods, will have on children. Dave Haradon, the board president of Family Promise of Southern Chester County, drew a distinction between alleviating homelessness and eliminating it. The goal of Family Promise is to start families who are in crisis on their way to self-sufficiency. Families stay in the program for an average of eight weeks. Kate Uhler, the case manager of Kennett Area Community Service, has been one of the major advocates for Family Promise of Southern Chester County since the first meeting was held 14 months ago. Uhler said that the organization often receives requests for help from families that have no place else to turn. She said that right now there are six families who are being temporarily housed in motels because there is no space in area shelters. Family Promise of Southern Chester County has been well-received since the first meeting took place in June of 2014, and one illustration of that is the support that it has received from organizations like the United Way of Southern Chester County. In his report about fundraising efforts, Bill Carl, the board treasurer and fundraising chairman, said that Family Promise of Southern Chester County has received $30,000 in support from the United Way of Southern Chester County. Overall, the organization is attempting to raise about $170,000 in operating funds and an additional $70,000 for capital needs. One immediate goal, Carl said, is to meet the most pressing need, which is to find a way to fund a 14-passenger van to transport families during their stay in the program. 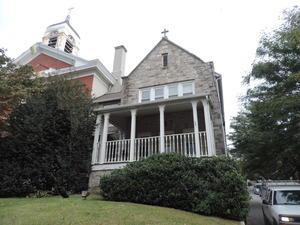 The Assumption BVM Church is providing Family Promise of Southern Chester County with its resource center—a building adjacent to the church in the center of West Grove—for just one dollar a month. “It fits our needs very well,” said board member John Kriza. He added that they are doing renovations on the building. The renovations include “new flooring, painting of the entire interior by four local Rotary Clubs, upgraded plumbing donated by Scott Zachary Plumbing, and a new furnace donated by Brandywine Heating and Air Conditioning,” Kriza explained. At the congregational agreement meeting, Father Scott Brockson, the new pastor at Assumption BVM, was thanked for the church’s generous donation of the resource center. Brockson reiterated the church’s support for the Family Promise program. Haradon said that Family Promise of Southern Chester County was grateful for the support that the program has received from the community. The Family Promise organization itself has been a tremendous resource for those working to establish the program in this area. Now that the congregational agreements have been signed, it won’t be long until the local organization is assisting families in the community. Deb Schmittle, the recruitment chairperson, said that she expects to have the 13th host church, and perhaps the 14th host church, signed on by the end of July. “We only need one more support church to complete our recruitment process and we have several churches looking to help fulfill that role,” Schmittle said. Officials are hoping to conclude the search for the executive director with a final round of interviews of the candidates taking place in August. At some point this fall, the first families will be helped by the new program. The Unionville Presbyterian Church is already in line to host the first week. Church leaders are eager to start providing this new service to the community. “A lot of the churches do things on their own, but to have this cohesive effort is going to be good,” said John Brennan, a volunteer with Assumption BVM. Mark Terry, pastor of the United Methodist Church in Oxford, said that he thought the initiative will be a good use of resources that churches have. “We have these big, beautiful churches and these people who have a real heart for helping others,” he explained. Grace Laughinghouse said that when she started attending services at the Oxford United Methodist Church, she asked Terry about needs that existed in the community. He told her about the need to help families who are in a dire situation. “It’s an amazing opportunity to make a change,” Laughinghouse said. Ruth Simonson of Westminster Presbyterian Church said that church members there are very eager to start helping these families in need. “When there’s a meaningful initiative, there are people who are willing to help out,” she said, explaining that scripture is very clear about going out to help others. Korengel, who is slated to take over as the president of the board of Family Promise of Southern Chester County later this year, said that churches are supposed to come together to provide help to those who need it the most. “This is what God calls us to do,” she said.